Caltrans Traffic Advisory: Highway 37 will be closed this weekend! Saturday, March 23 at 7:00 PM until Sunday, March 24, 2019 at 10:00 AM - All work is weather permitting. 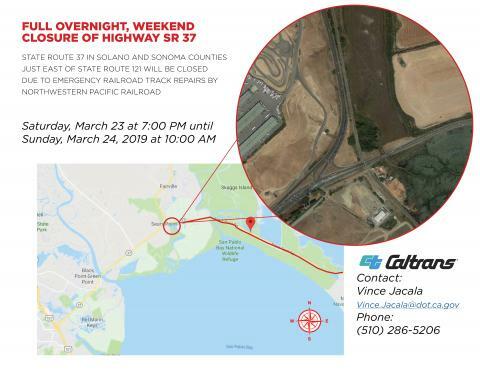 State Route 37 in Solano and Sonoma Counties Just East of State Route 121 Full Overnight Weekend Highway Closure Due to Emergency Railroad Track Repairs by Northwestern Pacific Railroad Saturday, March 23 at 7:00 PM until Sunday, March 24, 2019 at 10:00 AM SOLANO and SONOMA COUNTIES – Caltrans in cooperation with the Northwestern Pacific Railroad has scheduled a full overnight weekend closure of State Route 37 (SR-37) just east of State Route 121 (SR-121) in Sonoma County. The closure is needed to allow for emergency repairs to the railroad crossing at the intersection of SR-37 and SR-121 just east of Sears Point. Northwestern Pacific Railroad company will perform the repairs. Full Overnight Weekend Highway Closures-Start Saturday, March 23, at 7:00 PM To ensure worker and public safety, a full overnight highway closure of SR-37 just east of SR-121 in Sonoma County is scheduled to start on Saturday, March 23 at 7:00 PM until the morning of Sunday, March 24 at 10:00 AM. Motorists are advised to watch for detours, allow additional travel time and take alternate routes if possible. Local access is available for residents and emergency vehicles only. During the closure, motorists should use northbound SR-29, then westbound SR-12, then southbound SR-121, and re-enter westbound SR-37 at the SR- 121/SR-37 interchange. Motorists should use northbound SR-121, eastbound SR-12, southbound SR-29, then re-enter eastbound SR-37 at the SR-29/SR-37 interchange. The California Highway Patrol (CHP) will help direct motorists. Caltrans will activate changeable message signs.